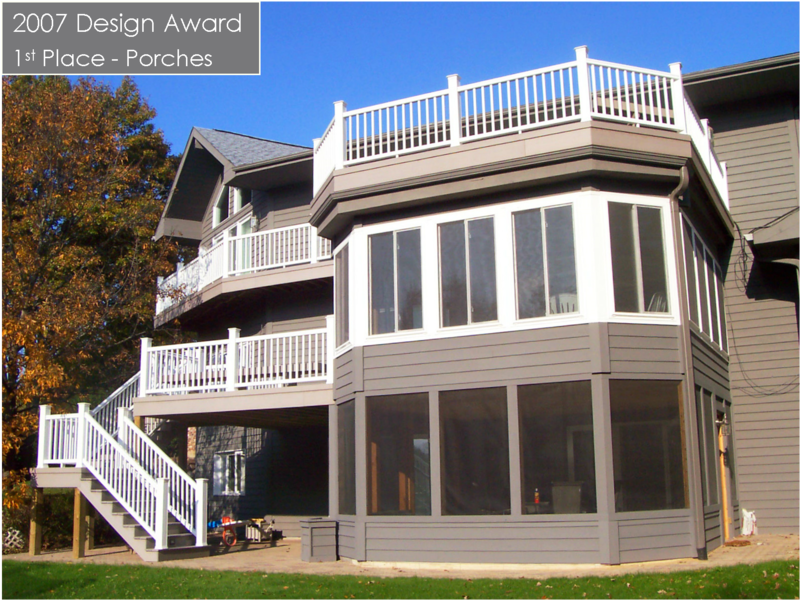 What roof style should your new Chicagoland porch or sunroom have? Gable? Shed? Hip? Flat? 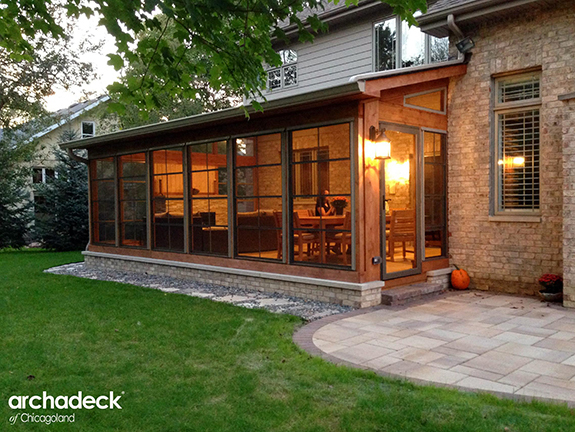 As you begin dreaming about adding a new porch to your Chicagoland area home, one of the the first things you will do is envision what what your new room will look like. You will likely have a general room shape, location and roof style in mind. You will have some “must haves” and some “absolutely nots” on your list. 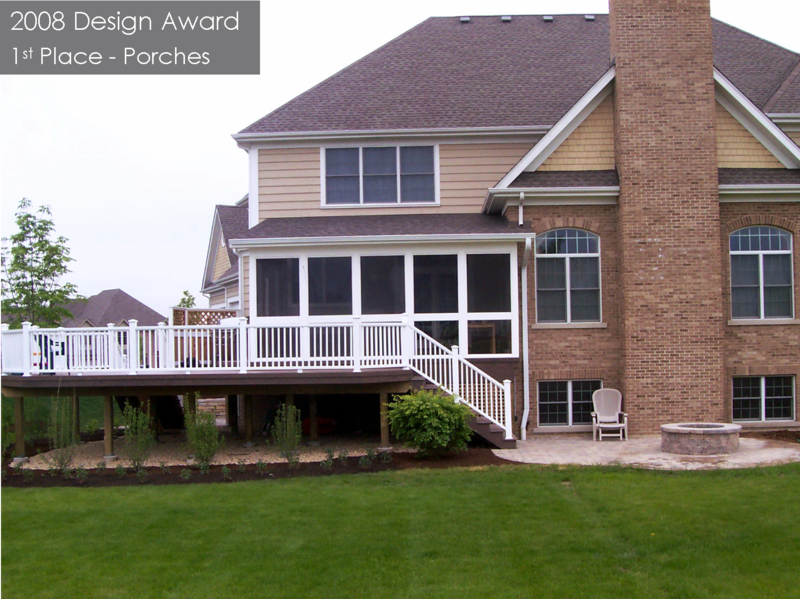 We have seen a lot of these lists as we’ve helped homeowners translate their requirements and visions into a porch design for their home. Almost inevitably, the first thing on the list is “lots of light!”. 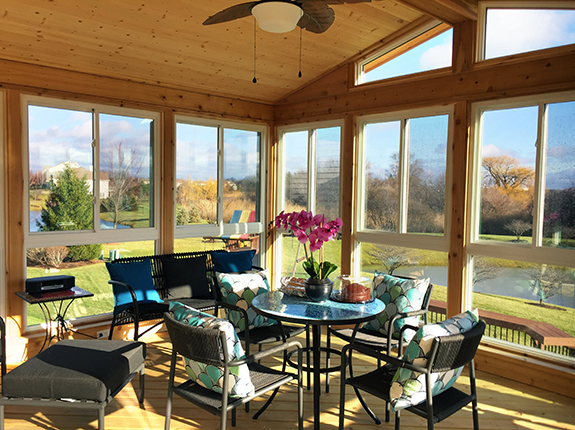 Whether you are looking for a screened porch, an open porch, a sunroom, or a 3- or 4-season room, you are most likely hoping for a sunny and bright space to enjoy your home and your backyard too. 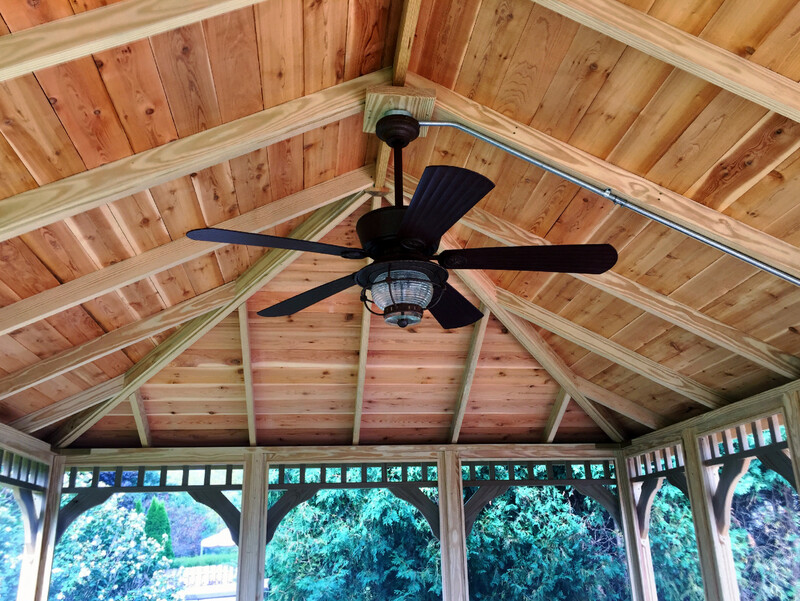 Some of the key decisions we will help you make early on include where your porch should attach to your home, how large your porch should be and what roof style is best. In this blog, we want to share some information about choosing the porch roof that’s best for you. 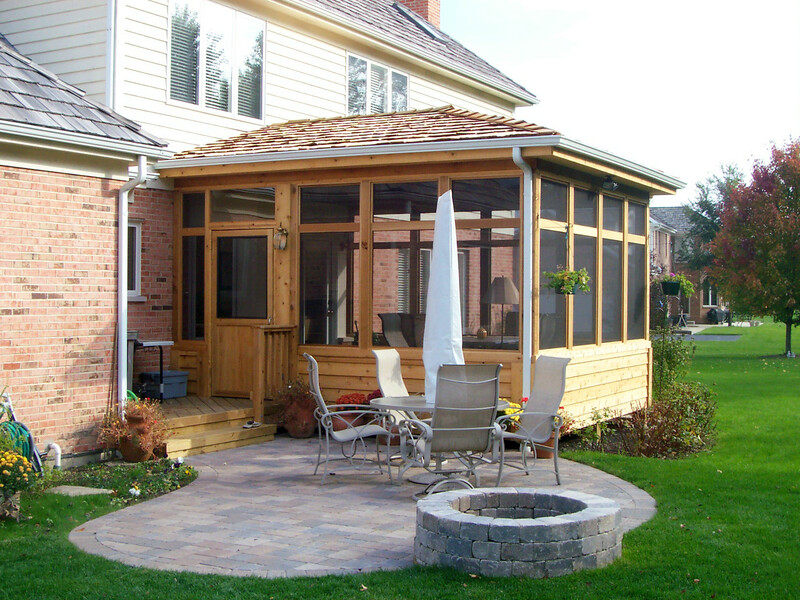 Your options for your Chicagoland area porch include a gable roof, shed roof, hip roof or a flat roof. Here is some information and key considerations for each type. A gable roof is one of the most highly sought roof shapes. It is the shape that essentially makes a triangle. It has a high point in the middle and slopes down in 2 directions from that high point. There are a couple reasons this style is popular. First, it creates a vaulted ceiling on the inside. Secondly, the elevated ceiling lets a good deal of sun into the room. Third, the gable end or ends can be transparent using glass or screening to further increase the visibility out into the yard. If you have your heart set on this style, you first need to find out if it works with your home. There is a key functional and key aesthetic factor that influence this decision. Functionally, you do not want the roof of a new room to block second story windows. If your second story has a number of windows, that may limit the height and style of roof that will work with your home configuration. From an aesthetic design perspective, it’s important to make sure the roof style is a fit with the roofline or rooflines of your existing home. 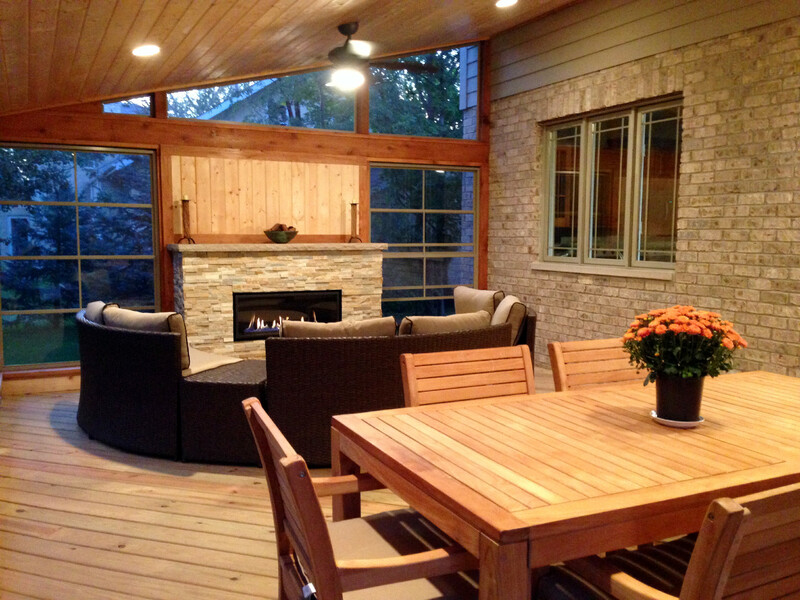 You want your new porch or room to look like it is original to your home. Does your home have a gable roof? A Shed roof? Does it have a couple different roof lines? We want to make sure the new roof shape fits your home by complementing what exists. It’s important to note that you do not need to match the roof shapes with your existing rooflines but you do want to make sure they complement eachother. This home has a shed roof over the home section and a gable roof over the garage section. 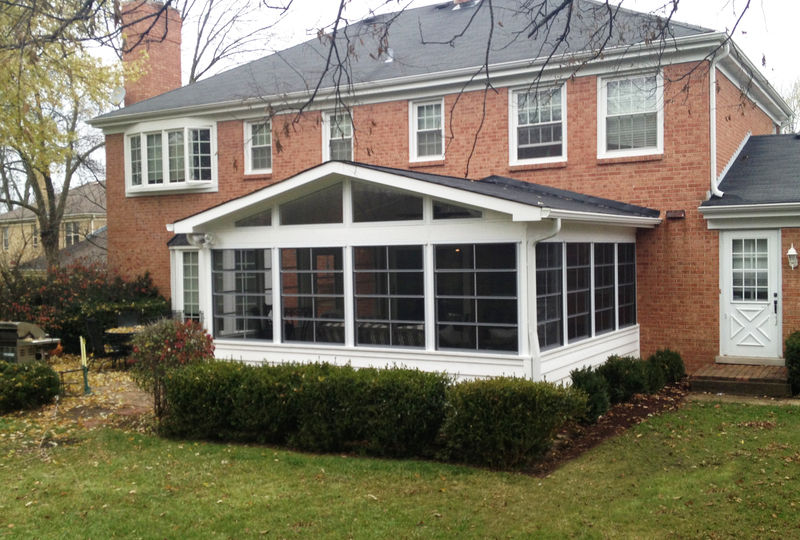 Take a look at how nicely this gable roof screened porch looks on this home. A shed roof style essentially makes a half triangle. It is connected to the house and slopes downward in one direction from there. It is a great option if your second story limits connecting a higher roof or if a more elevated roof style would block the view from the second story. From a light perspective, this roof style does not generally allow in as much light as a gable roof but that depends on the orientation of your backyard to the room, the height of the roof connection, the number of trees in your yard and other factors. Like the gable roof, a shed roof can be open on the ends with either glass or screening depending on the room type. This ensures that more light enters the room. 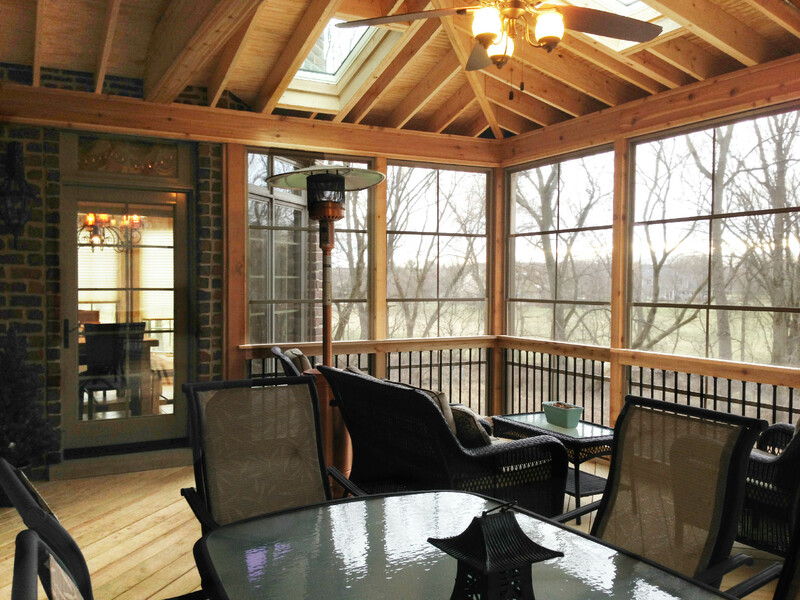 Above is the interior view of the shed roof sunroom shown above. You can see that the space seems very spacious vertically. The hip roof style is very popular especially with more upscale homes. This roof shape has a high point in the middle and slopes downward in three or more directions from that high point. A hip (or hipped) roof essentially creates the shape of a pyramid. It is the most complex from a construction standpoint and may cost more than a different, simpler roof shape. This roof shape is aesthetically pleasing to the eye especially from the inside. The geometric complexity adds more visual interest than a more traditional shape. As you see in the pictures above, the new room’s roofline does not need to match the home as long as it complements the home. One thing you’ll notice in the picture immediately above is that shed roofs can have tremendously varying heights. This roof shape is an alternative to a shed roof or flat roof for a house with second story obstructions. The first question we always receive about a flat roof is whether it will hold water. The good news is that flat roofs are not completely flat for that reason. Any good builder will build a slight angle and proper drainage into the space to ensure no resting water. This being said, if this room addition is in an area subjected to falling leaves and other debris, those can certainly accumulate on the roof. A flat roof is often selected when there are significant vertical constraints. But there is also tremendous appeal to this roof shape especially as it relates to an open porch. This shape is also very pleasing to the eye. The height of the roof can often compensate for the fact that less light enters the room than if it had a more elevated roof style. It’s important not to forget about great options for any roof shape. One of these is skylights. Skylights have multiple benefits including being aesthetically pleasing and helping to allow more light into the house.